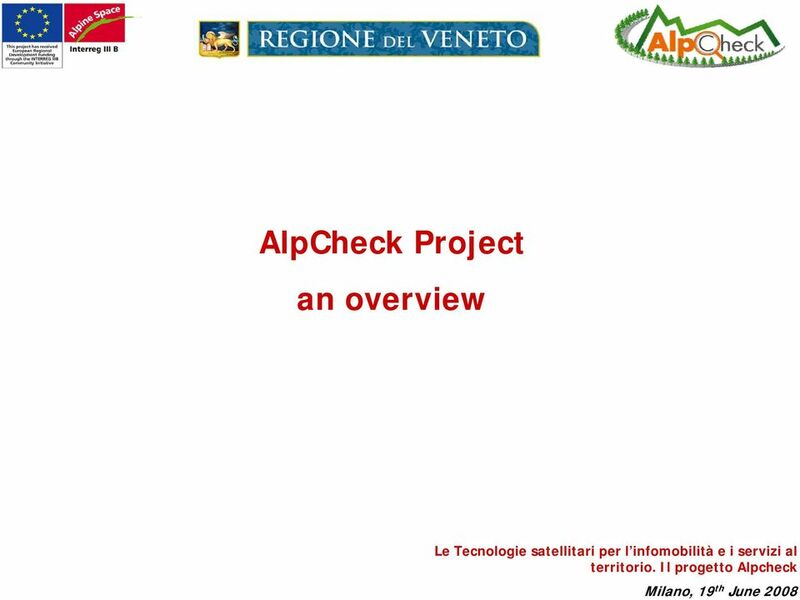 Download "AlpCheck Project an overview. 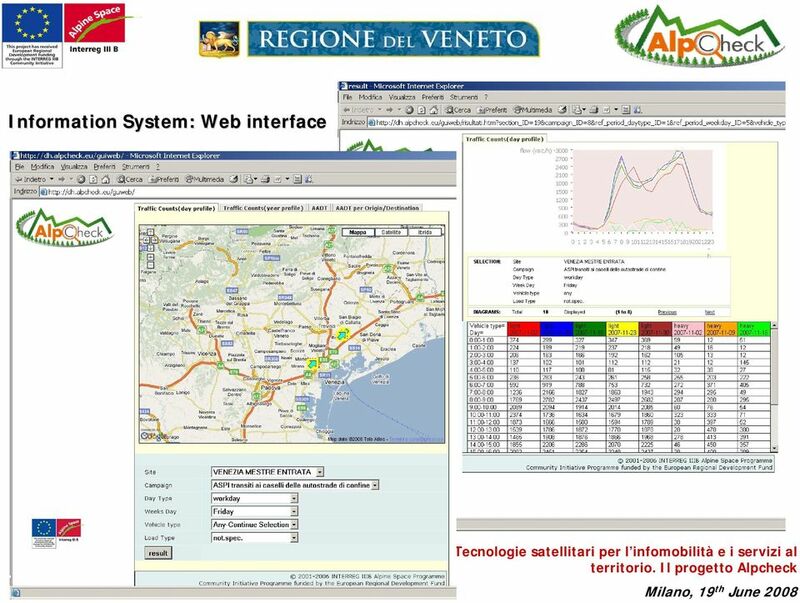 Le Tecnologie satellitari per l infomobilità e i servizi al territorio. 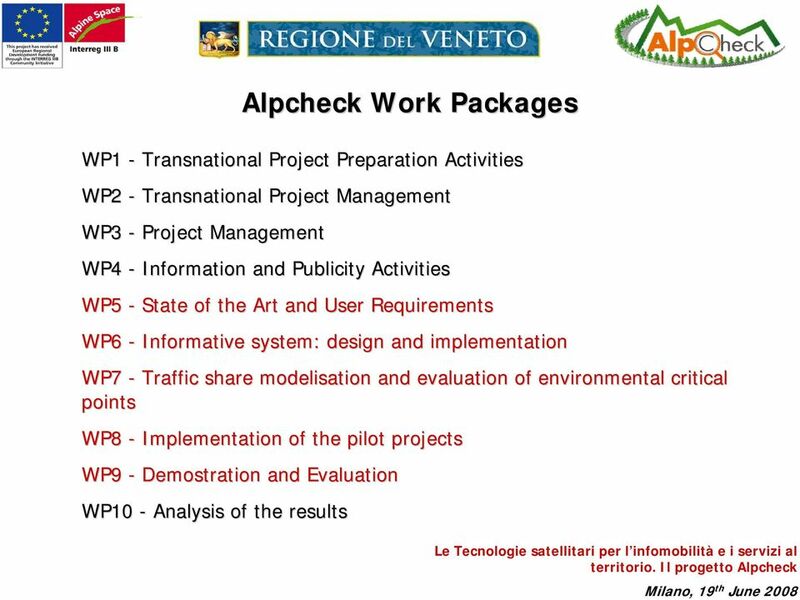 Il progetto Alpcheck"
6 Technical Work Packages main contents WP5 - State of the Art and User Requirements Definition of the information system requirements by a survey to road network operators and an overview on European Projects about mobility monitoring in Alpine Space WP6 - Information System: design and implementation Implementation of a DataWareHouse containing traffic flow data from different existing sources and from AlpCheck Pilot Projects. 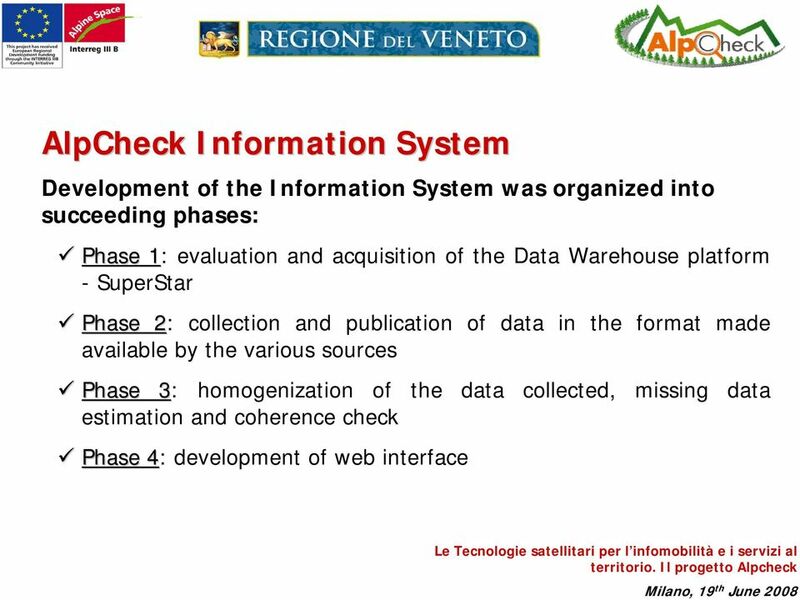 Implementation of procedures for data homogenisation to make them comparable. 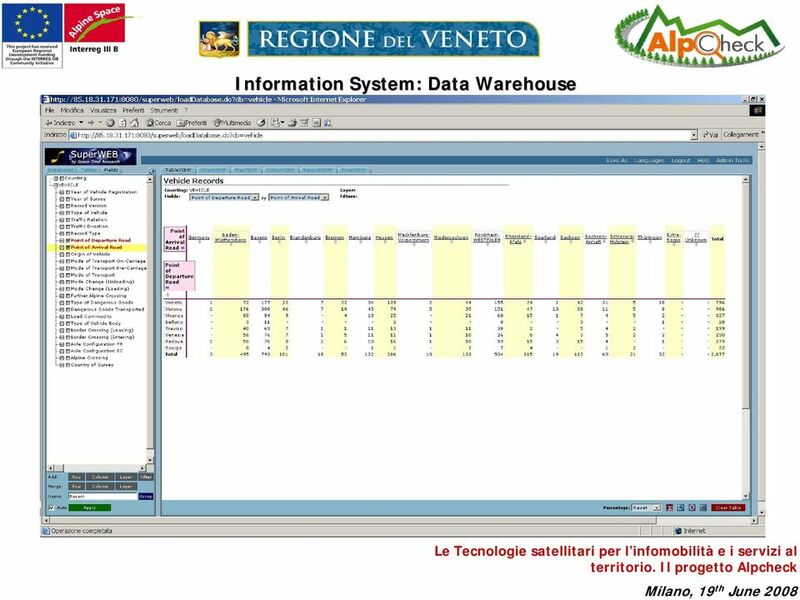 To easier the access to the datawarehouse informations, an interface will be developed using Google Earth capabilities. 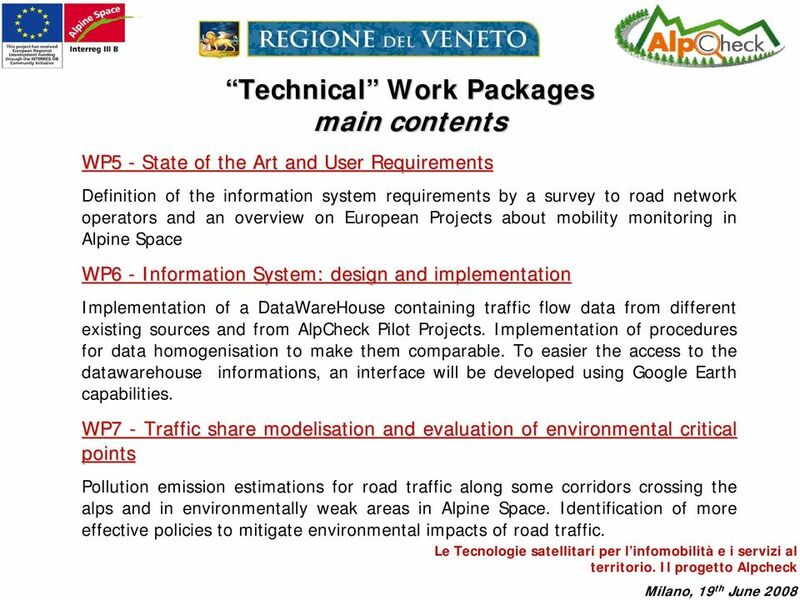 WP7 - Traffic share modelisation and evaluation of environmental critical ical points Pollution emission estimations for road traffic along some corridors crossing the alps and in environmentally weak areas in Alpine Space. 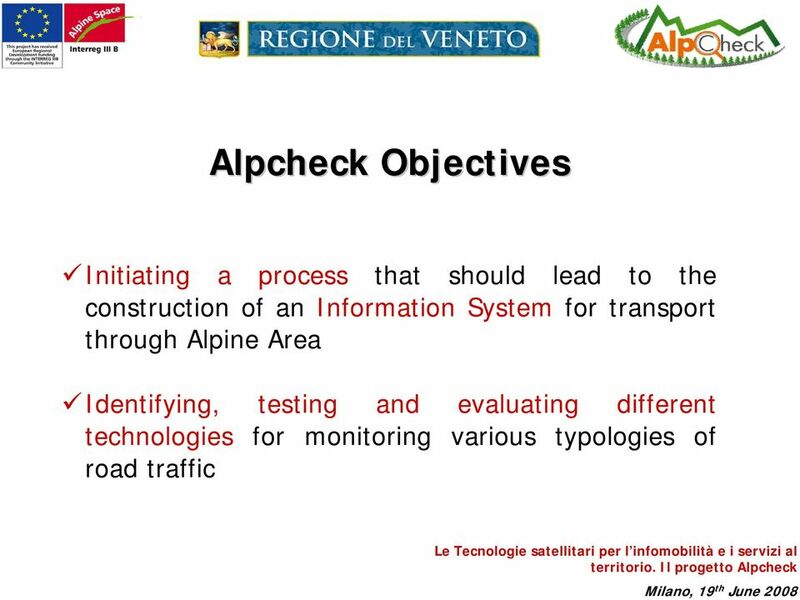 Identification of more effective policies to mitigate environmental impacts of road traffic. 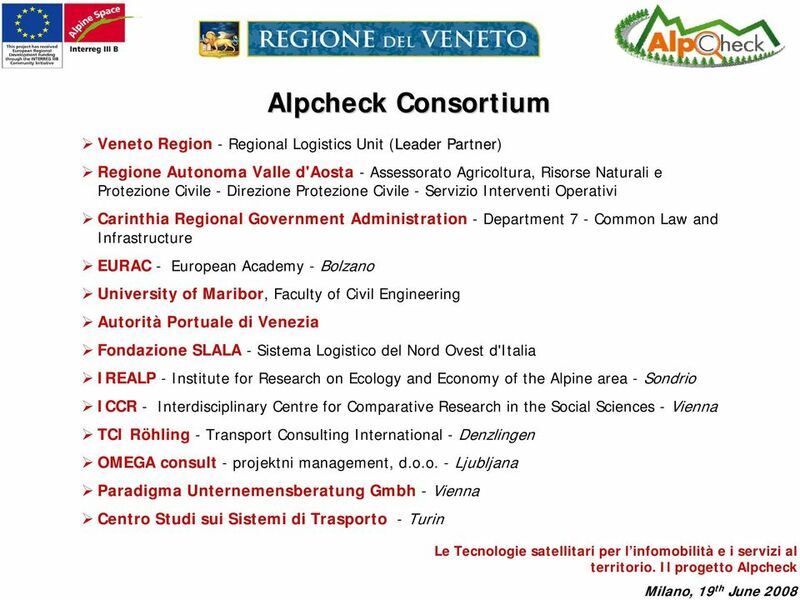 THE INTERREGIONAL TABLE FOR SUSTAINABLE TERRITORIAL DEVELOPMENT OF THE PADAN-ALPINE-MARITIME AREA. Leaders on the North-South Axis. 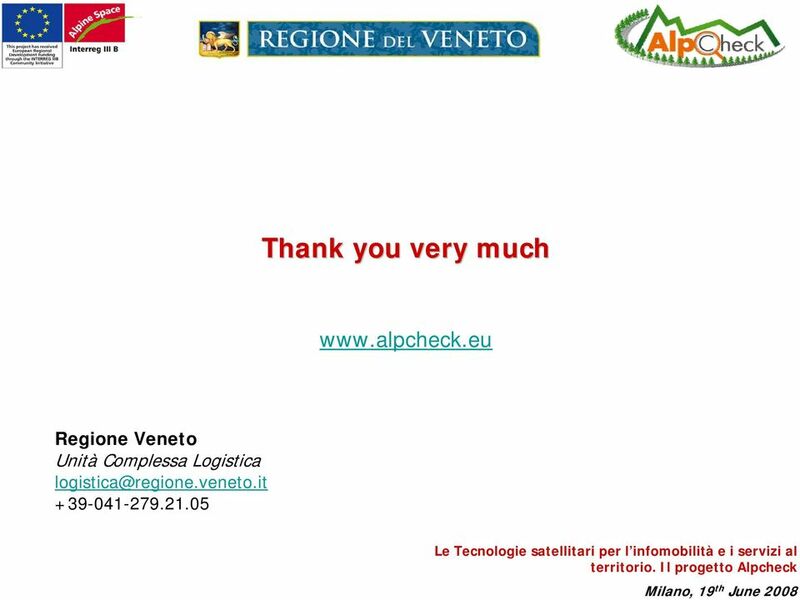 Quality in Motion: Intermodal Transport. Blocktrains. Rolling Highway. 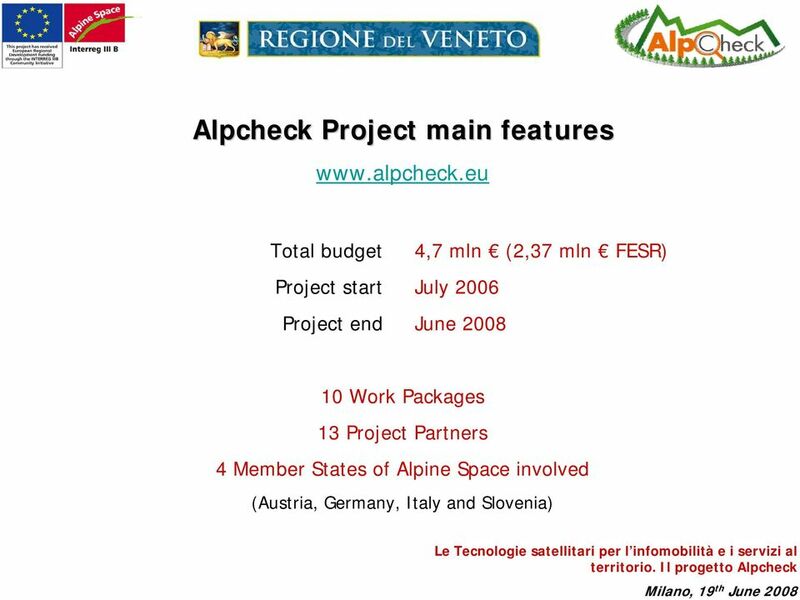 Disaster Mitigation of Debris Flows, Slope Failures and Landslides 639 Anthropogenic Caused Mass Movements and their Impact on Railway Lines in Austria Christian Rachoy 1) and Manfred Scheikl 2) 1) Dept. 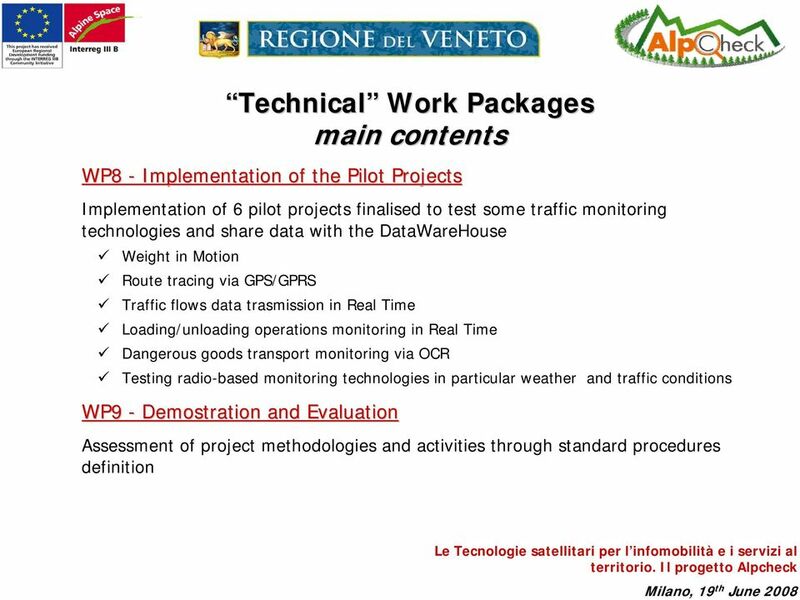 Pre-commercial public procurement and cross-border Living Labs Innovation Union: the contribution of Europe s regions and cities Brussels, 27 November 2013 Open innovation in Aosta Valley WhatisaLivingLab? Collaborative Research. COURAGE. Collaborative Research on Ageing in Europe. Kick-off Meeting 22 23 June 2009 Milan, Italy.
. Collaborative Research on Ageing in EUROPE Collaborative Research On Ageing g Kick-off Meeting 22 23 June 2009 Milan, Italy A project funded by the EU Commission . Collaborative Research on Ageing . E N G I N E E R I N G E X C E L L E N C E Tunnel ventilation n Tunnel ventilation know-how Ventilation is a key element of electro-mechanical equipment and is crucial to the safety of tunnel operation. FRE FRE IFT IFT S.A.
Introduction. 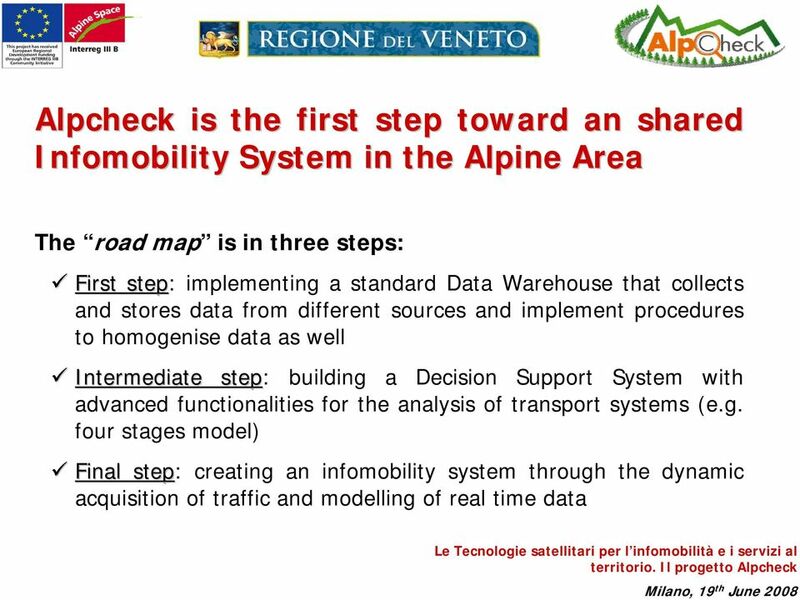 We will refer in particular to the list of issues : Part I - n 7 and n 12 Part III - n 1: (ii) points a, c, e.
Product distribution is a crucial phase for every company and has to be manage simply, quickly, allowing the timely traceability of their cargos.